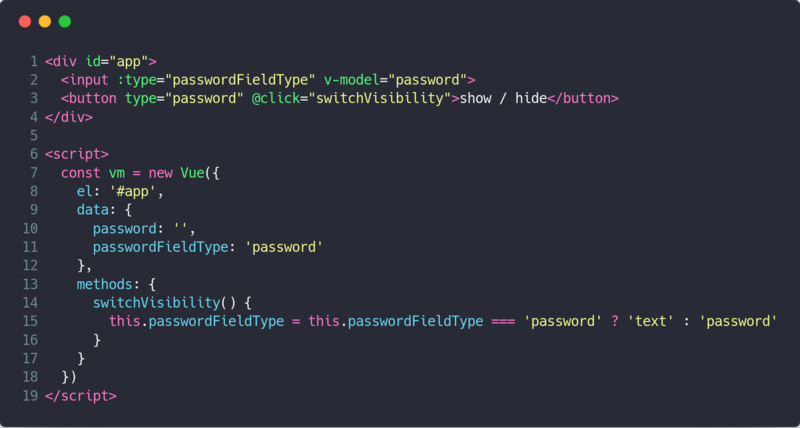 The basic idea behind showing / hiding the value of a password field is, that you have a clickable element, which switches the type of the input field. That's it. If you are familiar with the basics of Vue.js, this piece of code won't scare you that much. Anyways, I will explain it below step by step. This code produces exactly the same visual output as the raw JS implementation above. These two examples are pretty small and concise. No CSS is involved at all. If you want to play around with a slightly more sophisticated example, I've pushed a repository to GitHub, which containes the example from the animated gif at the beginning of this post. The live demo can also be explored online. Deploying to AWS Lambda doesn't have to be painful and involve many manual steps. It can be quick, automated and a matter of a few seconds. We'll show you hot to configure deployment in a few minutes.